THE “COBHAM”, one of the ten single-driving-wheel engines designed by William Dean and built for the GWR between 1878-79. The cylinders of the “Cobham” measured 18 in by 24 in; driving wheels had a diameter of 7 ft, the total heating surface was 1,214¼ sq ft, and boiler pressure 140 lb. These “singles” worked principally on express services between London and Wolverhampton. THE steady improvement in locomotive design that had been proceeding since the inception of railways to the year 1880 continued to the end of the nineteenth century. Many types of engine incorporated features of design such as are now in general use, and weights showed a marked tendency to increase as more and more was demanded of the locomotive to meet the growing needs of the railways. During the period 1880-90 there was a revival in the use of the single-driving wheel engine, particularly after the steam sanding apparatus was introduced in 1886. The blowing of sand by means of a steam jet under the driving wheels greatly increased the adhesion, and enabled the locomotives to start and haul heavier loads. The story of the famous “singles” is told in the chapter beginning on page 1091. Express engines of the 2-4-0 type continued to be built. On the London and North Western Railway the “Precedent” class was increased by ninety-six new locomotives with 6 ft 9 in coupled driving wheels and a boiler pressure of 160 lb per sq in. The North Eastern Railway built in 1885 some 2-4-0 engines of the “Tennant” class, with 7 ft 1 in driving wheels and 18 in by 24 in cylinders. James Holden built a series of 110 engines of the 2-4-0 type for the Great Eastern Railway. These locomotives had 18 in by 24 in cylinders and 7 ft driving wheels. Another type of engine in general use at that time was the 4-4-0. The 4-4-0’s are described in the chapter “A Famous Locomotive Type”, beginning on page 1173. Notable examples were the Midland engines of 1885-87, with 18 in by 24 in cylinders and 7 ft driving wheels. The 4-4-0 engines designed by James Stirling for the South Eastern Railway in 1884 had 19 in by 24 in cylinders. At the end of 1889, 117 of these engines had been constructed, and many of them, re-built, ran for over fifty years. In 1882, William Stroudley introduced his famous “Gladstone” class of 0-4-2 express passenger engines, some of which gave half a century of service. Thirty-six of these fine engines were built by 1891. The cylinders were 18¼ in by 26 in; coupled wheels were 6 ft 6 in diameter, and the weight, without tender, was 38¾ tons. Locomotives of the 0-4-2 type were also built for the London and South Western Railway by Wm. Adams. Ninety of the Adams engines were built between 1887 and 1895. Cylinders were 18 in by 26 in, and the coupled wheels were 6 ft 1 in diameter. Other engines designed by Adams included the 4-4-2 outside-cylinder tank locomotives used on the LSWR for local traffic. These had 17½ in by 24 in cylinders, 5 ft 7 in driving wheels, and weighed 54 tons. Seventy-one of these tank engines were built between 1882 and 1885. Large numbers of 2-4-2 tank engines, with a radial axle at either end, were built by T. W. Worsdell for the Great Eastern Railway in 1884-85. Cylinders were 18 in. by 24 in, and the driving wheels were 5 ft 4 in diameter. The weight of the engines was 51 tons 18 cwt, and the tanks held 1,200 gallons of water. These engines were the first to use cast steel centres for the driving wheels. SUPERHEATED LMS TANK LOCOMOTIVE, formerly owned by the Caledonian Railway. Cylinders measure 19 in by 26 in, diameter of coupled wheels is 5 ft 9 in, boiler pressure 170 lb per sq in, total heating surface, including superheater, 1,716 sq ft, and total weight in working order 91 tons 13 cwt. Tractive effort at 85 per cent boiler pressure is 20,704 lb. Large tank engines of this type were also designed by Sir John Aspinall in 1889, and were built for the Lancashire and Yorkshire Railway for about twenty years. The cylinders of these engines were 18 in diameter by 26 in stroke, and the coupled wheels were 5 ft 7 in diameter. pressure cylinders driving one axle, and two outside low-pressure cylinders driving another axle. wrought iron by F. W. Webb in 1880. Other improvements of the ‘eighties included the use of ‘I’ section coupling rods, the substitution of metallic packing for the hemp formerly used for piston and valve rods, air-operated water pick-up scoops and more commodious locomotive cabs. Train speeds in 1884 reached a maximum of about seventy-five miles an hour, and the normal loads on the fast expresses were not generally in excess of 150 tons. In 1894 the last of the 2-2-2 engines had been built for the Great Northern Railway, and many of these ran for twenty years. This type of locomotive had ceased to exist on British railways by the end of 1914. A large number of 4-2-2 “singles” were built, however, between 1890 and 1900, for the Great Western, Midland, Great Eastern, North Eastern, Great Northern, and Great Central Railways. The Great Northern “singles” designed by H. A. Ivatt in 1900-1 were the last of this type to be built for a British railway. BUILT FOR THE CALEDONIAN RAILWAY, this 4-4-0 locomotive is now owned by the LMS. Cylinders measure 20½ in by 26 in, and the diameter of the driving wheels is 6 ft 6 in. Grate area is 20.7 sq ft, boiler pressure is 180 lb per sq in, and the total weight of the engine alone is 61¼ tons. An interesting comparison may be drawn between Mr. Ivatt’s singles of 1900 and his famous “Atlantic” locomotives of 1910, which after twenty-five years were still hauling main line trains in 1935. A similar comparison can also be made between the Great Western singles of 1894 and the famous “City” class of locomotives on that railway. Both of these engines were designed by W. Dean, the latter type having the 4-4-0 wheel arrangement. A feature of the 4-4-0 express passenger engines of this period was the placing of frames and cylinders between the wheels. A “MOGUL” BUILT IN 1912 for freight service by the Caledonian Railway. This 2-6-0 engine has cylinders 19½ in by 26 in, the diameter of the coupled wheels is 5 ft, and the total wheel base is 24 ft. The grate areas is 20½ sq ft, and the boiler pressure 160 lb per sq in. The weight of the engine is 54¼ tons, and the tender 37¼ tons. The latter can carry 3,000 gallons of water and 4½ tons of coal. 0-6-0 locomotive, built by Sharp, Stewart and Co in 1891, was formerly owned by the South Eastern & Chatham Railway. The East Kent Railway has seven locomotives in operation on its nineteen miles of standard gauge tack. The system is one of the few remaining independent lines in Great Britain. It serves the Kentish coalfields, and the principal traffic is freight. AN “ATLANTIC” EXPRESS ENGINE, formerly of the North Eastern Railway, hauling an LNER train near Barkston, Lincolnshire. Designed in 1911, these three-cylinder locomotives have 16½ in by 26 in cylinders, and a total heating surface, including superheater, of 2005.8 sq ft. The boiler pressure is 160 lb, and the engine alone weighs, in working order, 77 tons 2 cwt. The apparatus above the boiler is a feed-water heater. In 1890-92 some 4-4-0’s were built by W. Adams for the London and South Western Railway with outside cylinders 19 in by 26 in, and 7 ft 1 in driving wheels. Others of this class had 6 ft 7 in drivers. A fine working sectional model of one of these graceful locomotives may be seen in the Science Museum, South Kensington. 26 in cylinders and 7 ft 7 in driving wheels, the largest coupled wheels ever used in Great Britain. The North Eastern “R” class of 4-4-0’s were fitted with piston valves, and used steam at a pressure of 200 lb. Sixty of these engines were built between 1899 and 1907. In 1896 J. F. Mclntosh introduced the famous “Dunalastair” class of 4-4-0 engines with 18¼ in by 26 in cylinders, 6 ft 6 in driving wheels, and boilers having a diameter of 4 ft 8 in - an unusual size at that date. These were followed a year later by the “766” class, also with 6 ft 6 in driving wheels, but having cylinders 19 in by 26 in. These engines were provided with double bogie tenders carrying 4,125 gallons of water and seven tons of coal. 4-4-0 locomotive had two outside cylinders 12½ in by 24 in and inside cylinders 14½ in by 26 in. Driving wheels were 6 ft 9½ in in diameter, and the inside cylinders were fitted with Howe-Stephenson link motion, which also drove the outside valves by rocking levers. This locomotive was rebuilt by R. H. Whitelegg in 1923 with a larger boiler, which was superheated, outside cylinders 14 in by 24 in, and inside cylinders 14 in by 26 in. It received the name “Lord Glenarthur”. Locomotive Type”, which begins on page 1173. The London and South Western’s 4-4-0 engine, No. 720, built by D. Drumrnond, had firebox water tubes and two pairs of uncoupled driving wheels. The front pair was driven by two inside and the rear pair by two outside cylinders. The cylinders were 16½ in (afterwards reduced to 15 in) by 26 in stroke, and the driving wheels were 6 ft 7 in diameter. The boiler heat- ing surface was 1,664 sq ft, and the engine weighed 54 tons 11 cwt. Five more locomotives of this type were built in 1901. No. 720 was rebuilt with a larger boiler in 1905.
the Lancashire and Yorkshire Railway in 1899-1902. Forty of these engines were constructed with 19 in by 26 in cylinders and coupled wheels 7 ft 3 in diameter. The boilers had a heating surface of 2,053 sq ft and a grate area of 26 sq ft.
had been built by Sharp, Stewart and Co for the Highland Railway. These locomotives weighed 56 tons and had outside cylinders 20 in by 26 in, driving 5 ft 3 in coupled wheels. begins on page 1046. In 1900 some inside-cylinder 0-8-0’s were built for the Lancashire and Yorkshire Railway; they had 20 in by 26 in cylinders, 4 ft 6 in wheels, and Joy’s valve gear. Contemporary with these engines were the 0-8-0’s of H. A. Ivatt on the Great Northern Railway, with inside cylinders 19¾ in by 26 in and 4 ft 8 in wheels. The boiler heating surface was 1,439 sq ft, with steam pressure at 175 lb. The weight of the engines was 54 tons 12 cwt. A SECTIONAL VIEW of W. Adams’ London and South Western express locomotive. The engine was claimed in its time (1890-92) to be one of the most powerful express engines then operating on the lines of Great Britain. The total weight of the engines win working order was 48 tons 13½ cwt. AN EXPRESS LOCOMOTIVE OF 1892, designed by W. Adams for the London and South Western Railway. This 4-4-0 engine had cylinders 19 in by 26 in, diameter of driving wheels was 7 ft 1 in, total heating surface was 1367.7 sq ft, grate area 18 sq ft, and the boiler had a pressure of 175 lb per sq in. In 1897 the Belpaire firebox was adopted by W. Dean on the Great Western Railway and by Sir John Aspinall on the Lancashire and Yorkshire Railway It is now used extensively on most railways. About the same time (1897) that the water-tube firebox was fitted by D. Drummond to his London and South Western engines, F. W. Webb fitted double chimneys arranged in one casing to some of the London and North Western locomotives. One chimney was carried down through a horizontal partition in the smoke-box to draw the gases through the lower fire tubes. The other chimney served the top tubes. The idea was abandoned after two years’ service, but it makes an interesting comparison with the double chimneys of modern designs. Valves and valve-gear underwent a change during the ‘nineties; ordinary D slide valves were replaced by the piston and “balanced” type of slide valve. A balanced slide valve is one on which the full force of the steam is not permitted to press, thus reducing friction and the amount of power required to move it. Walschaerts valve gear was fitted by Beyer Peacock and Co to inside-cylinder engines for Northern Ireland in 1890; but the gear was not adopted for outside cylinders in Great Britain until a later date, except for a solitary tank engine acquired in 1881 by the Swindon, Marlborough and Andover Railway. From 1900 onwards locomotives with three and four high-pressure cylinders were developed, and their use was extended on all the principal British railways. to a Great Western 4-6-0 passenger engine and two goods engines on the Lancashire and Yorkshire Railway. The principle has since been generally adopted, Briefly, the Schmidt superheater comprises a number of steel pipes that pass backwards from the smoke-box through enlarged fire-tubes, returning to the smoke-box in the form of a long U. Steam from the boiler passes through these tubes on the way to the cylinders, and is so heated to a high temperature. Superheaters in use at the present time differ from the Schmidt apparatus only in constructional details; the operating principle remains the same. In 1906 G. J. Churchward on the GWR re-introduced the “top-feed” for locomotive boilers. This method of supplying feed-water to the steam space at the top of the boiler had been tried as early as 1863.
first of a numerous and successful class, now superheated. A number of “Atlantics” were built for the London, Brighton and South Coast Railway in 1911. These had 21 in by 26 in cylinders and driving wheels 6 ft 7½ in diameter. They had the same type of wide firebox as used on the Great Northern “Atlantics”, and weighed 68½ tons. cylinders 20 in by 28 in and 6 ft 6 in driving wheels. In 1912 J. G. Robinson designed the “Sir Sam Fay” class of 4-6-0 express passenger engines for the Great Central Railway. These locomotives had 21½ in by 26 in cylinders and 6 ft 9 in driving wheels. Four-cylinder engines were also built in large numbers during this period, for the Great Western, London and North Western, London and South Western, and Lancashire and Yorkshire Railways. Cylinder bores of these four-cylinder types varied between 14¼ in to 16½ in diameter and stroke between 26 and 30 in. Driving wheels ranged from 6 ft to 6 ft 9 in diameter. In 1917 J. G. Robinson introduced some powerful 4-6-0 engines on the Great Central Railway. These had four cylinders with inside link motion driving all four valves by arms on rocking shafts. R. W. Urie’s 4-6-0 engines of the London and South Western Railway had 22 in by 28 in cylinders and 6 ft 7 in driving wheels. These engines weighed 77 tons 17 cwt. A large number of powerful tank engines were built just before and during the war of 1914-18, and these have been described in the chapter on this type of locomotive, beginning on page 481. Many goods engines of this period were built with the 2-6-0 and 4-6-0 wheel arrangement, replacing the 0-6-0 type for fast freight traffic. For ordinary goods traffic the 0-6-0 engine was retained, and fine examples of the type are the superheated Midland engines designed by Sir H. Fowler in 1911. These have 20 in by 26 in cylinders, 5 ft 3 in wheels, and weigh 49 tons 2 cwt. A number of 2-6-0 engines were built for the Caledonian Railway in 1912, and also for the Glasgow and South Western Railway between 1901 and 1905. Between 1911 and 1918 J. G. Robinson designed a class of heavy 2-8-0 goods engines for the Great Central Railway. These have 21 in by 26 in outside cylinders driving on to the third pair of coupled wheels, which are of 4 ft 8 in diameter. Piston valves between the frames are operated by Stephenson’s link motion. The weight of the engine is 73 tons 17 cwt. seas. 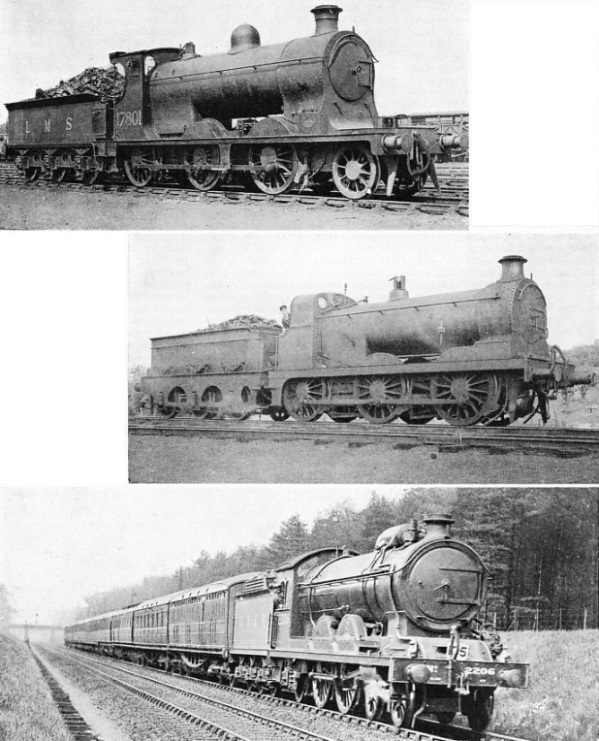 After the war, these engines were sold in large numbers to various British railways. In 1917 R. E. Maunsell built some powerful 2-6-0 goods engines for the South Eastern and Chatham Railway, with outside cylinders 19 in by 28 in, and driving wheels 5 ft 6 in. Their weight was 59 tons 8 cwt. Some large six-coupled goods locomotives were built for the Great Eastern and Great Northern (Ireland) Railways in 1920. 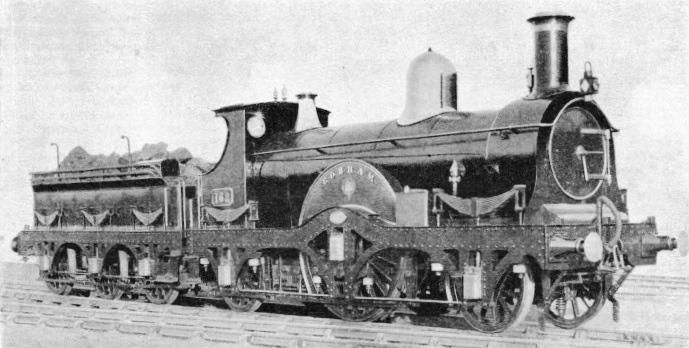 The Great Eastern engines, designed by A. J. Hill, have 20 in by 28 in. inside cylinders and 4 ft 11 in driving wheels. The Irish locomotives, designed by G. T. Glover, have cylinders 19½ in by 26 in, with 5 ft 1 in driving wheels. A large number of 4-6-0 goods and mixed traffic engines were built during the period 1919-21 for the London and South Western, North Eastern, and Great Central Railways. The Great Central engines, designed by J. G. Robinson, have four cylinders, 16 in by 26 in, and 5 ft 8 in driving wheels. In 1925 H. N. Gresley designed a 2-8-2 mineral locomotive with three cylinders 20 in by 26 in, and 5 ft 2 in driving wheels. NINETY-THREE OF THESE “ATLANTIC” TYPE ENGINES were built by H. A. lvatt for the Great Northern Railway. The last of the series was put into service in 1910. The engines have cylinders 20 in by 24 in, coupled wheels 6 ft 7½ in diameter, a boiler pressure of 180 lb per sq in and a total heating surface of 2,022 sq ft. For twenty years they were the standard express engines of the Great Northern Railway. Though now superseded on the heaviest duties by the “Pacifics”, they still work many important trains such as the “Queen of Scots” Pullman.